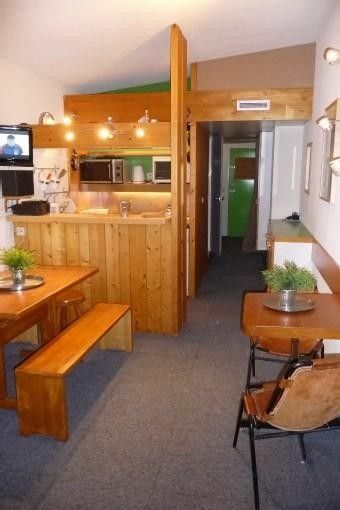 Flat 30m2, arranged as follows : entrance, 2 bunk beds 1 tray bed, location for ski storage, bathroom, lounge with a sofa bed, fully equipped kitchen, balcony. You'll find numerous arrangements and, among others, a hi-fi system, a DVD player, a device for raclette, etc... we've fitted this flat out so that you can feel at home. Car park (covered and outside) at 50 meters from the residence. A parking place (covered parking of Charvet) is also available with the rental. Conditions upon request. Possible rent of household linen and towels. Housework possible at the end of your stay.0DNo pets ! No smoking ! We thank you in advance for your understanding ! The property is a studio flat. A true ski in ski out property. Apartment is a bit dated but functional. It could do with a new Fridge and some wine glasses. The description of the apartment matches the reality. The place is nice, clean and cosy. Lots of various dishes, glassware and crockery, brand-new saucepans. The owner provides all necessary information and was able to arrange for our arrival outside of regular hours (we arrived at 21:00 on 1 January). We would recommend this place to young adults without children. It is ideal for 2, max 3 people, for more, I think, it would feel crowded (even thought there are 5 sleeping places), since the apartment is quite small. Everything about the apartment was good. It was well equipped and good access for the slopes. We've rented several apartments in Les Arcs and they were all very similar: built and designed to the same formula. This was better than average - in terms of furnishings and equipment. The only drawback was that you have to collect the key from an agency and on Saturday this involved us in quite a long wait (over an hour). Bien placé dans la station. Lit du salon très petit pour 2 adultes. Bref, bon potentirl mais doit investir un peu pour être à niveau. Appartement cosy, très bien équipé et conforme aux photos. Propriétaire disponible pour toutes questions. Appartement en très bon état, propre, facile d'accès. Il est idéalement situé par rapport au club Mini qui est dans le même bâtiment! Nous avons passé une très bonne semaine et reviendrons sans aucun doute! Contact facile avec le propriétaire et avec l'agence qui gère la remise des clés. At the last floor of a residence ("Les Lauzières"), with view on Mount Blanc, ideally located in the heart of the Charvet at ARCS 1800. Environment : you can start skiing at the steps of the residence. Ski school, nursery, cinema, restaurants, shops and ski-rental stores are at just a step from the residence.